It's not just a Democrat vs. Republican battle here; Golden has been a street safety opponent — and menace driver himself — for years. StreetsPAC, the city’s pre-eminent street safety political committee, has endorsed Democrat Andrew Gounardes to unseat Bay Ridge’s Republican State Senator Marty Golden, citing not only Gounardes’s support for congestion pricing, speed cameras and streetscape improvements, but blasting the eight-term incumbent as someone who “has distinguished himself primarily as an obstacle” to progress. Gounardes, a Bay Ridge native, is currently counsel to Brooklyn Borough President Eric Adams. StreetsPAC endorsed him, citing his work on a Community Board 10 subcommittee dedicated to pedestrian safety, and working with Bay Ridge Advocates for Keeping Everyone Safe (BRAKES). His campaign includes a pedestrian safety platform. Golden, on the other hand, blocked New York City’s life-saving speed camera program, and has even racked up 14 speed camera violations since 2014. He also ran over a pedestrian in a crosswalk in 2005, causing injuries so severe that she died having never left the hospital. 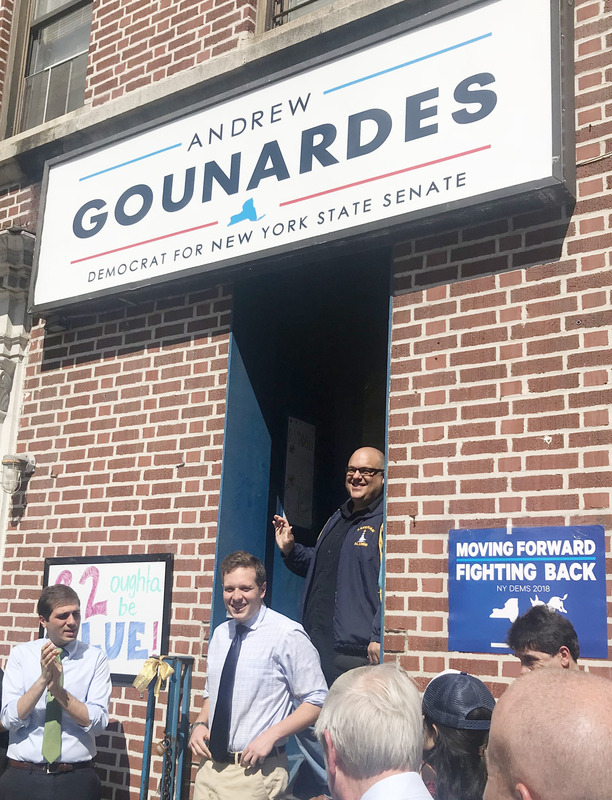 StreetsPAC had declined to endorse a candidate in the Democratic primary, where Gounardes defeated journalist Ross Barkan, who was on hand to support Gounardes on Saturday. “I’m here because defeating Marty Golden is crucial,” Barkan said. Council Member Brad Lander, State Senator Michael Gianaris, congressional candidate Max Rose and Attorney General frontrunner Tish James were also on hand. The balance of power in Albany hangs in the balance. Currently, the Republicans control the chamber, 32 seats to 31, thanks to Democrat (in name only) Simcha Felder, who caucuses with the GOP. Defeating Golden would give Democrats control of the chamber — matching the party’s control of the Assembly and the Governor’s mansion. StreetsPAC and other activists believe that Democrats would quickly expand the speed camera program and also create a congestion pricing system to lessen traffic and fund the MTA. Gounardes’s answers to Streetsblog’s candidate questionnaire during the primary suggest that he will be a strong advocate for reform. I support congestion pricing provided that two important criteria are met. First, the funds raised from any congestion pricing plan must be dedicated solely and wholly to our mass transit system, specifically our subways and buses. Second, the proposed investments to mass transit must be definite, concrete, and immediate, and must include upgrades to the signaling network and making all subway stations accessible for all. Golden serves as the Senate’s representative on an MTA oversight committee, but he has shown little interest in the agency’s poor service to his constituents. He blocked efforts to improve bus service in his district last year, helped his party cut MTA funding, and, of course, helped the GOP block speed cameras, which caught millions of speeders — including Golden many times — since being turned on in 2014. The city eventually went around the Senate and restored the cameras this summer. StreetsPAC-endorsed candidates dominated the primaries last Thursday, beating several members of the Independent Democratic Conference, which, until it broke up earlier this year, caucused with the Republicans and enabled the GOP’s rejection of critical street-safety measures.